Most of the meals I’ve shown so far in this series are perfect dinners. But what about the humble mid-day meal, where you just want something smaller and lighter – and something that’s very quick to prepare? I thought I’d share one thing that we often make when we find turkey deli meat on sale. 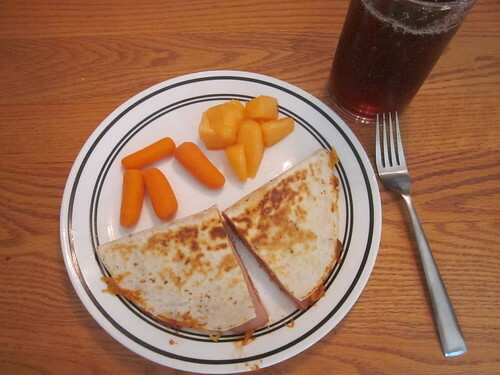 This meal includes fresh cantaloupe from the garden, baby carrots (on sale! ), and some iced sun tea (that I’ll mention below). 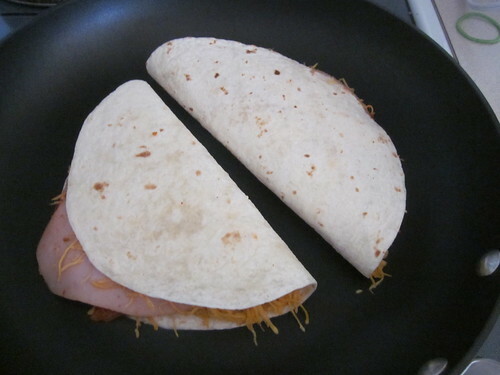 The quesadillas are the main part, though, and they’re very simple to make. 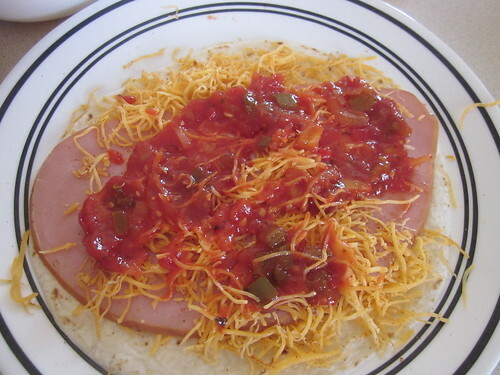 Simply take a tortilla, put a piece or two of turkey deli meat on top, add some salsa and some shredded cheese (cheddar, monterey jack, whatever cheese floats your boat), and fold it over nicely. 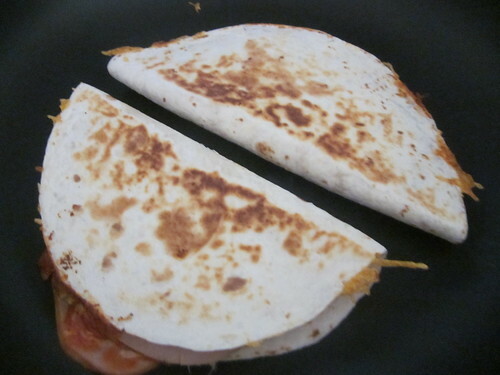 Just take these folded-over quesadillas-in-waiting and put them in a skillet – you don’t need any butter or anything like that in the skillet. Turn the heat to medium-low (closer to medium) and cook until the bottom side has a few brown spots on it (as a good cooked tortilla should). Then flip it and continue cooking until this bottom side has a few brown spots on it. You’re done. We cut them in half, but you can eat it whole if you’d like. Fresh vegetables and fruits – especially ones that can be eaten as finger foods – are a perfect accompaniment. This is a real hit with our family and it takes about ten minutes from “we ought to have lunch soon” to having a finished meal on the table. Plus, the cost of that plate above is less than a dollar, it’s quite tasty, and it’s fairly healthy, too. You’ll notice in the photo above that I’m drinking a reddish-looking beverage. It’s actually pomegranate green sun tea. 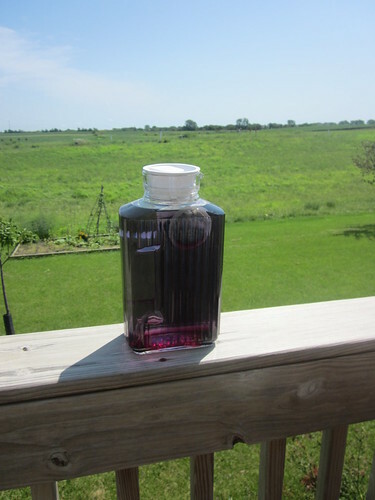 Sun tea is an absolutely wonderful thing, something we drink a lot of during the summer. It’s incredibly tasty and very inexpensive to make. All you have to have is some tea bags and a sealable container to sit on your porch all day. 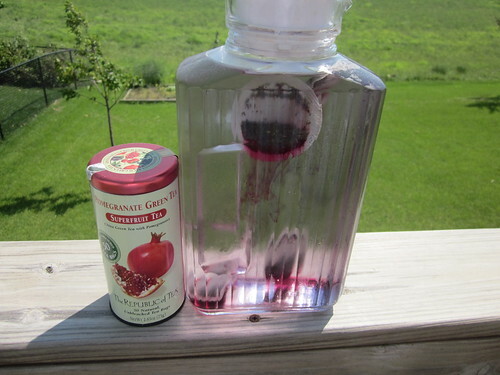 Above, we’re starting a batch of that pomegranate green sun tea. In a half-gallon of cold water, we just added four of the tea bags from a Republic of Tea canister we had in the cupboard – roughly $0.75 worth of tea. If you used other types – Lipton or even Celestial Seasonings – the cost of the tea would be much less for a half-gallon of tea. Just fill your container up, put four tea bags in it for every half-gallon of water, and sit the container on your porch or deck where it’ll be in the sun most of the day. You can go to work while it sits – just go about your normal day. When you get home – an hour or two before you’ll drink it – just take it inside, use a spoon to retrieve the tea bags out of the liquid, and sit it in the refrigerator to cool (you can use the freezer, but don’t forget about the tea). Here’s our sun tea not long before it came inside. The tea was delicious – we just added a tiny bit of honey to the half-gallon and the whole thing was sublime. A big glass of it only cost about $0.15, too, which is far cheaper than buying equivalent quality bottled tea at the store. It’s also a fantastic thing to serve guests. Make a couple containers, each with a different flavor, for some variety. For example, I myself really like the sun tea made by the Celestial Seasonings Mandarin Orange Spice tea bags, available for about $2 a box at most grocery stores.